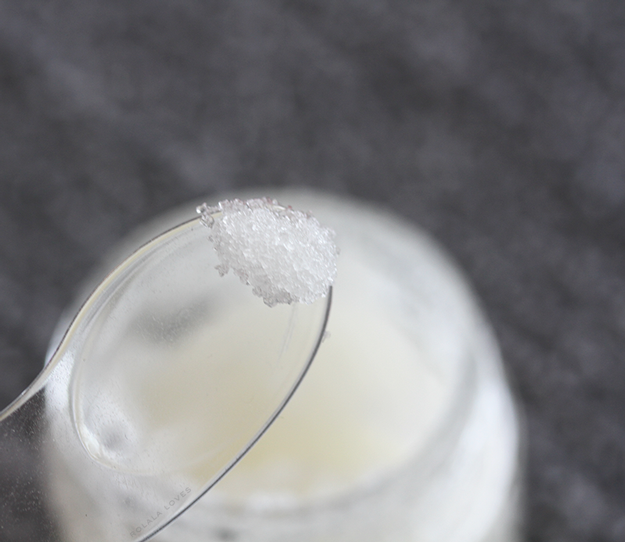 I always have a lip scrub in my beauty arsenal whether it be prefab or DIY. Since lips don't have oil producing glands, the only way to get rid of dry, flaky, dead skin is through gentle exfoliation. Regular exfoliation helps to keep lips smooth and soft which creates a primed base for whatever balm or lip color you apply over them. 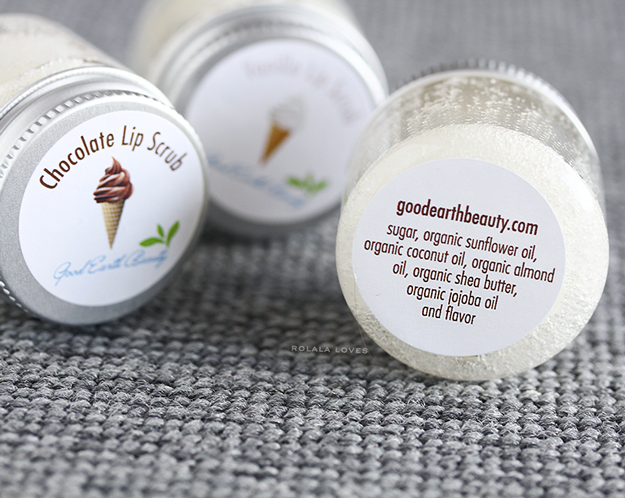 Today I'm reviewing a set of lip scrubs from Good Earth Beauty and we also have a set to give away. And Rena and Ian who are big on ice cream these days wanted to help me introduce them! About the Brand: Good Earth Beauty is a unique online beauty shop that carries a range of natural, organic and cruelty-free products chosen and personally tested by their staff. Product lines include skincare, bath and body, cosmetics, haircare, perfumes and pet care. 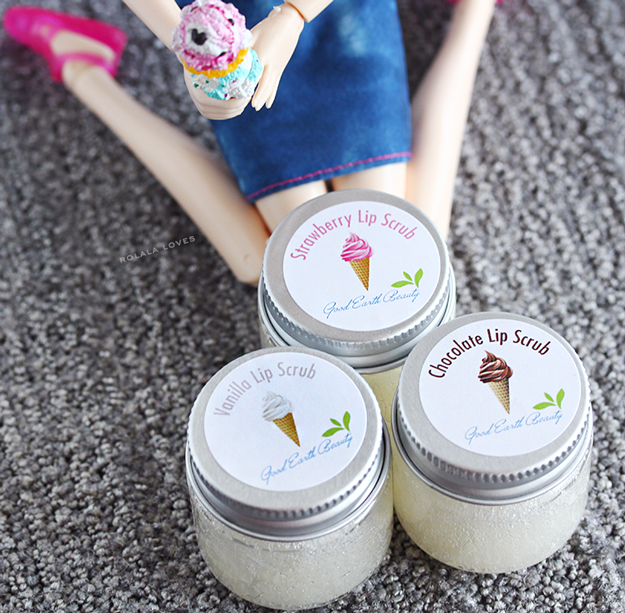 This set of Ice Cream Flavor Lip Scrubs is a Good Earth Beauty Exclusive product. It includes 3 all natural lip scrubs in Chocolate, Vanilla and Strawberry. They are made of only natural (and some organic) ingredients. These work to will exfoliate and eliminate dry flaky skin to leave lips soft and moisturized. Ingredients: Sugar, organic sunflower oil, organic coconut oil, organic almond oil, organic shea butter, organic jojoba oil and flavor. Packaging: A lightweight, clear plastic jar with a metal screw off cap. How to Use: Gently massage onto lips using circular motions. Rinse off or wipe away with a tissue. My Impressions: These lip scrubs are not unlike others that I've used in terms of texture and effectiveness. They remove flaking skin and leave my lips feeling soft, smooth and supple. They did a terrific job with the flavors especially the strawberry which is my favorite and the vanilla is really good as well. These smell absolutely delicious! The chocolate flavor was more of a cocoa than chocolate which wasn't bad but I just didn't care for it as much as the other two. I liked that these worked and that I can actually fully understand each ingredient used in them. The price is also quite reasonable. If you don't want the whole set, you can actually purchase Good Earth Beauty lip scrubs individually for $8.25. The other flavors available are Pink Lemonade, Bubblegum, Vanilla Lavender and Cherry Vanilla. The company offers free shipping on all orders in the US and free samples are included with every order. They also ship internationally. or the Rafflecopter widget below. The widget can be a little temperamental so if it doesn't load on this page, just CLICK THROUGH HERE FOR IT! Good luck! Do you use lip scrubs? Disclosure: This post was sponsored by Good Earth Beauty and features products received for editorial consideration. For more details about my product review policy, copyright, and information about affiliate links, please refer to the Policies page of this blog. How cute are these lip scrubs, I will be getting these in. lovely post. I be honest I stop joining giveaway but its a cute one here hope someone enjoy it. these products sound very great! Have an adorable day. I use one by LUSH. I know they are easy to make yourself, but the flavors they use are so yummy. I love buying and making lip scrubs, but these sound wonderful. And so glad to see the dolls today! Ooh the strawberry one sounds fabulous! I love a good lip scrub and you're reminding me to use mine! I think I've saw Kim reviewed these a couple of weeks ago, I might be wrong though. These sound great, Rowena and another great giveaway from you. Good luck to everyone who entered! I would like to try those lip scrubs!!! Oooo I need this! I get so chapped. Especially in the fall and winter. I've been meaning to buy a scrub for like ever. Oooooo....this brand sounds great, and I like the fact that they're reasonably priced to boot:D Good luck to the giveaway participants! I used to use lip scrubs a lot but not lately. I think it's the LUSH one I used to buy often. PS Lovely to see Rena and Ian again! Saw these on IG and thought they looked great. Love the vanilla flavor. I have a lip scrub from Lush but not sure where I put it, I need to use it more my lips are always chapped. These sound good to, I like the one from Lush so I bet I would like these. 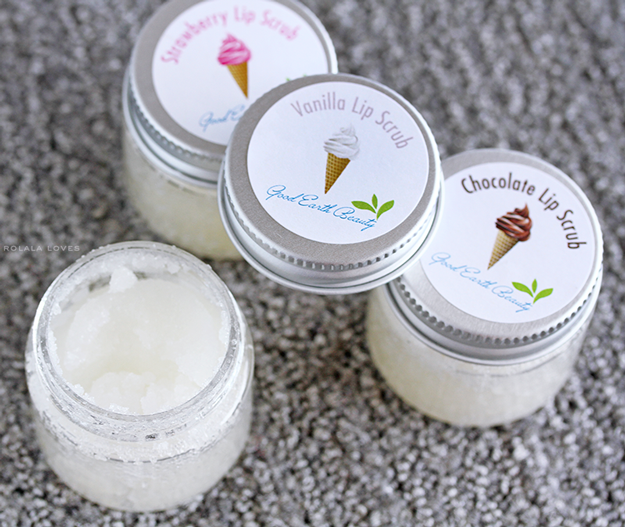 The lip scrubs sound wondeful, especially the vanilla flavored lip scrub! This lips scrub are sooooo cute, I like the design of package! These lip scrubs sound great and the packaging is a bonus! The vanilla sounds great! I really love anything vanilla flavored. I'd love to try the chocolate one! These dolls are adorable! And the lip scrubs look pretty great too. I haven't used one in a while so thank you for the reminder. Great giveaway! These lip scrubs sound really great! Oh this is such a lovely giveaway! I don't have a preference about the flavour, because I would love to try them all. Maybe the chocolate, or the strawberry, dunno really. Thanks for this giveaway, Rowena! how adorable you choose them two to present these products to us! such adorable photos...love them all! Congrats to the winner, how sweet he entered it for his wife (I remember reading that in your newest post)...Tony must be a sweet guy. Anyway, it was a cool giveaway....a good lipscrub goes a long way.